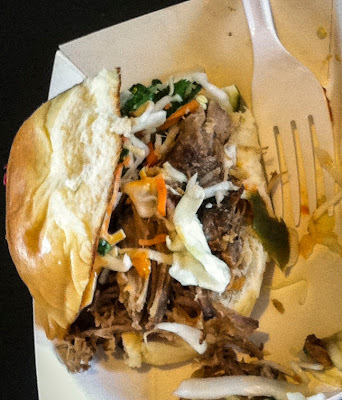 Marination Ma Kai features Hawaiian Korean food you don't want to miss. I am late to the party, never having been to the Marination Station or even ordered from the Marination food truck. After just one meal a the Marination outpost in West Seattle, I'm a fan in the making. I am ready to return, planning to nibble my way through everything else on the menu, to savor each flavor-popping bite. My excuse might be trying to grab a few passable photos, since I failed at iPhoneography this week, or I could claim to crave the spectacular city view on a sunny day. But no, it's really all about the food. Just skim the unique Ma Kai menu (link). 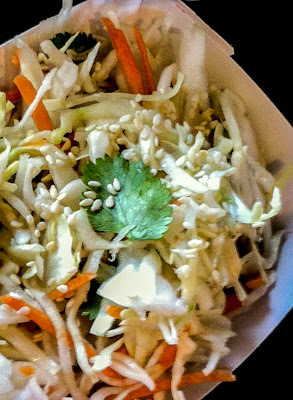 You too will be tempted by Aloha Kalua pork sliders, perfectly-cooked fish tacos, Kalua pork and kimchi quesadillas, crispy fries just waiting for a dash of Ponzu or Sriracha sauce and slaw with a snappy zing. Hey, you might even order shave ice or one of the spam specials - why not, the food is delicious. 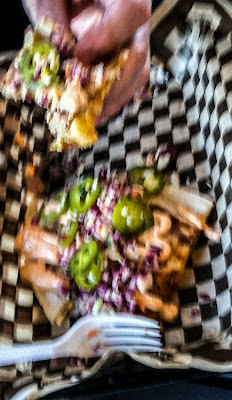 Photo: fuzzy photo of one remaining bite of a fish taco (my favorite), a spicy pork taco and a Kalbi beef taco. What you can't see is my smile of satisfaction over the surprisingly good fish taco. Photo: slightly psychedelic pic of RL's quick-to-disappear Kalua Kimchi Quesadilla. He gave it two-thumbs up, but next time will request "More kimchi, please." 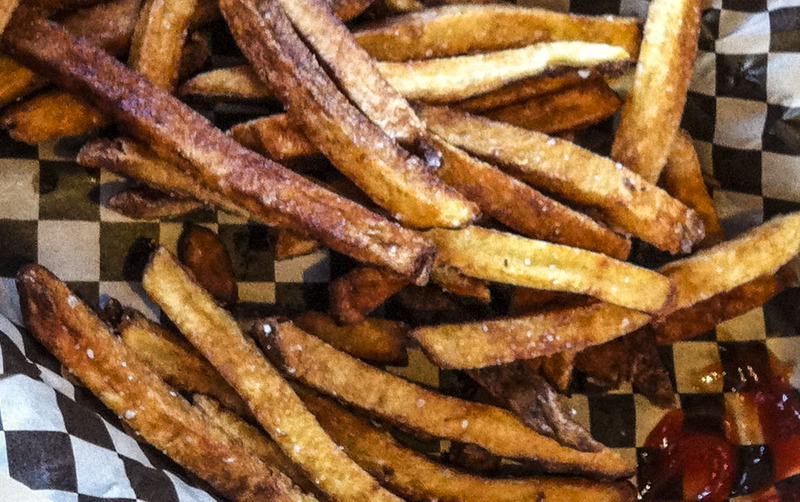 Photo: my favorite kind of fries, some crispy and others very crispy, that are delicious unadorned but even better sprinkled with Ponzu or dipped in Sriracha sauce. Ma Kai's Katsu pork sandwich remains to be sampled and compared with the Katsu Burger, a Georgetown notable that I really tried to love. I may not get to it for a while, not while house-made Portuguese sausage Breakfast Sliders and Portuguese Sausage Musubi call my name... or the Biscuits and Portuguese Sausage Gravy... or a Mini Banana Macadamia Nut Loaf waits to be dessert for breakfast. And we haven't even explored the well-stocked bar yet, but an advertised Blackberry Margarita sounded very tempting. Ma Kai offers casual dining with engaging counter staff, a manageable menu that is well executed, and flavor combinations that are anything but ordinary. 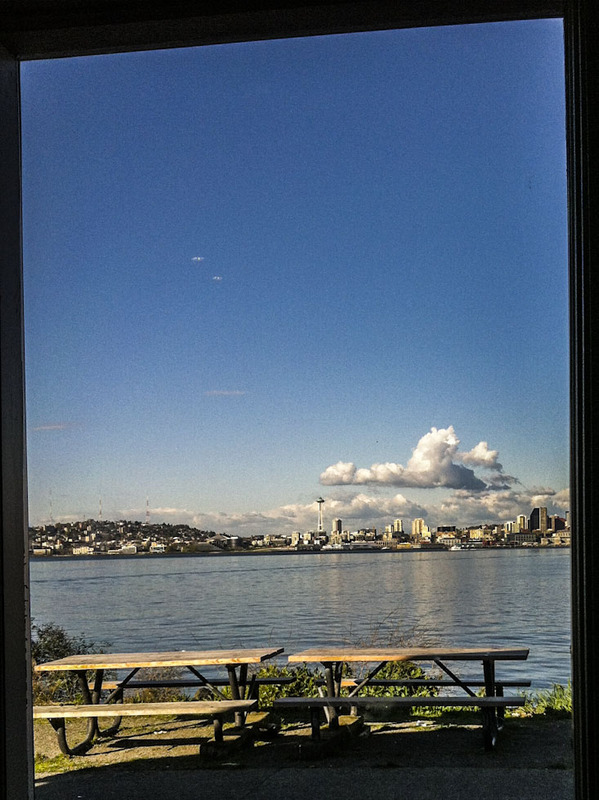 I love the West Seattle location and the spectacular view, but they are secondary - I'll return for the food. Soon. Seattle's Space Needle flanked by Queen Anne and Downtown. 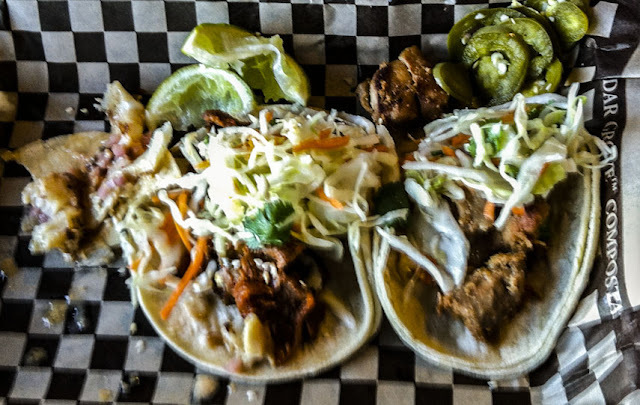 Read about the history (link) of Seattle's now nationally-known Hawaiian Korean taco truck, a success that has expanded into two brick-and-mortar locations. But more importantly, drive to Ma Kai's location in the old Seacrest Boathouse building at Alki Beach in West Seattle, go right now, and graze your way through their unique offerings to discover your favorites. Do it! A.M. update: it must be a pork and kimchi kind of week. Food52 posted a recipe for a Kimchi, Pork + Scallion Pancake with Watercress-Radish Relish. It sounds weirdly tempting. I've heard of them, next time I'm in Seattle I'll definitely have to try some of their grub! I would love to know what you order and and if you recommend your choice. that is a beautiful view, and any food eaten looking at it must taste great! So true... and a sunny day helps too.